The concentration of carbon dioxide (CO2) in the atmosphere rises due to emissions caused by man. The rate of increase in the atmosphere, however, varies considerably from year to year. This is not caused by differences in the emissions, but rather by a change in the amount taken up by the terrestrial biosphere each year, shows a study published in Science this week. One of the authors of the article is associate professor Guy Schurgers from Department of Geosciences and Natural Resources Management, University of Copenhagen. 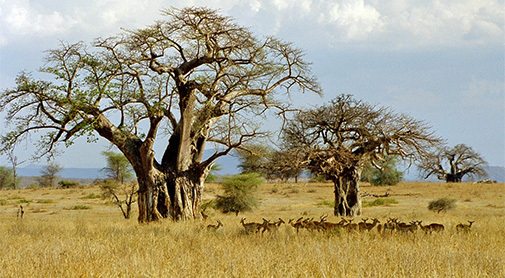 In the study published in Science this week it is shown that these variations in the terrestrial uptake are mainly caused by semi-arid ecosystems such as savannas. These ecosystems are sensitive to year-to-year changes in the weather conditions. The study shows that there is a low uptake of CO2 through photosynthesis during years where these ecosystems experience warm and dry conditions. During years with cold and wet conditions there is however a high uptake of CO2. Productive ecosystems, such as tropical forests, take up a large proportion of CO2, but the changes observed over the last 30 years, as well as the year-to-year variability, are dominated by semi-arid ecosystems. These ecosystems are affected by large-scale climatic phenomena such as El Niño: a climate pattern that occurs approximately every five years. During El Niño events, the uptake of CO2 in these semi-arid ecosystems is particularly low. Climate models suggest that these events will become re common in the future. This will reduce the ability of these ecosystems to take up CO2. To determine the trends and variability in carbon uptake, the study used both computer models of ecosystem carbon cycling and estimates based on a large set of observations of CO2 fluxes from different parts of the globe. The new results are published in: Science, [Science 6237, 895-899] The dominant role of semi-arid ecosystems in the trend and variability of the land CO2 sink.